Hubby For Hire is a family run business who prides themselves on our attention to detail, customer service and care. We are in the Steveston area of Richmond but serve all of metro Vancouver including Burnaby, Surrey, Delta and more. We offer a full range of start to finish handyman services including renovations, restorations and typical household repairs (honey-to-do lists): -Drywall repairs and painting -Cabinets, vanities, countertops -Custom woodwork -Interior finishing, crown moulding, wainscoting -Floor and wall tiles -Wood/laminate flooring -Small antique restoration -Framing, windows, siding -Decks, stairs, fences. Trust us for all your home repair, renovation and improvement needs. With our craftsmanship and materials, we provide handyman services that are guaranteed. Our reliability means that we complete your home repairs and improvements on time. Our quotes are competitively priced. You get value for your dollar with Hubby for Hire. Hi, I’m Ken Miller, the founder and head handyman of Hubby for Hire. I’m the one in the middle of the picture, in the shadows, with my sons, Shea and Brendan. My family and crew look forward to meeting you. You’ll be more than satisfied hiring us to solve your home repairs, renovations, restorations and household “honey-to-do” list. See some samples of our work below and contact us to get started. We’d love to hear from you! 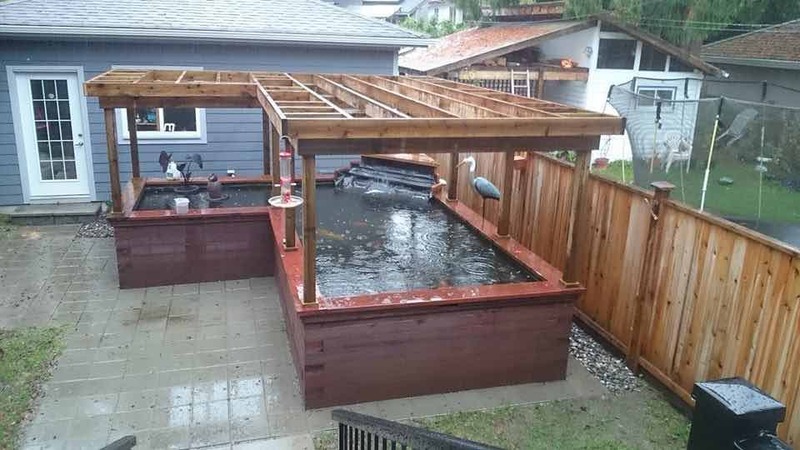 This is a backyard sanctuary that we designed and built. 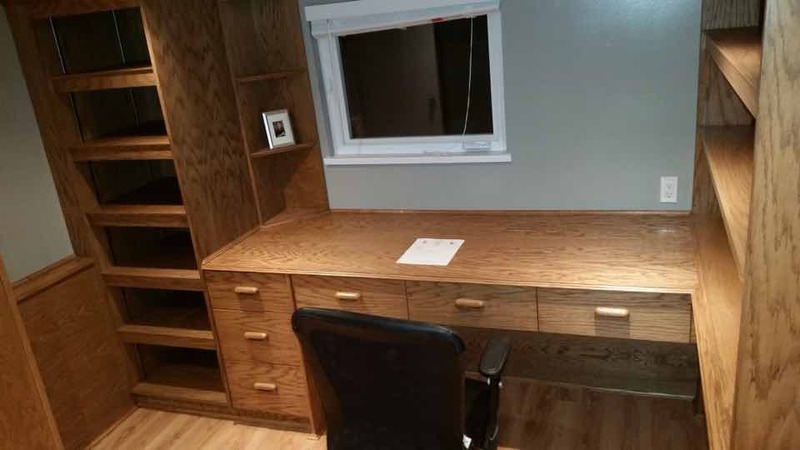 Custom office furniture that we built and installed. 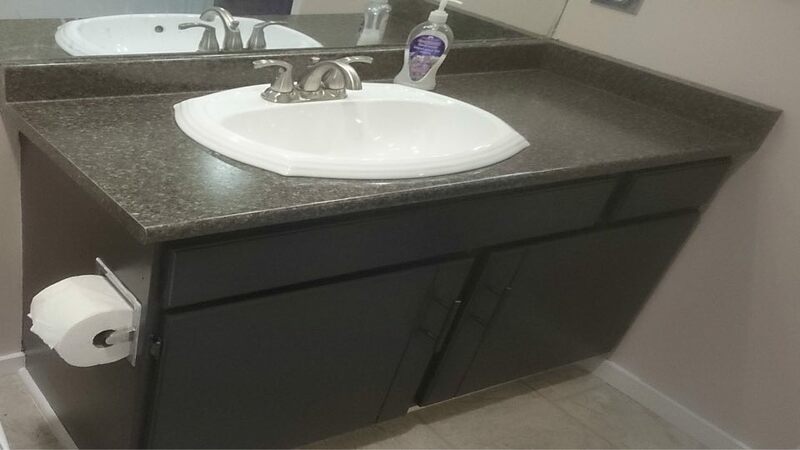 A new vanity that we installed freshens up this bathroom. 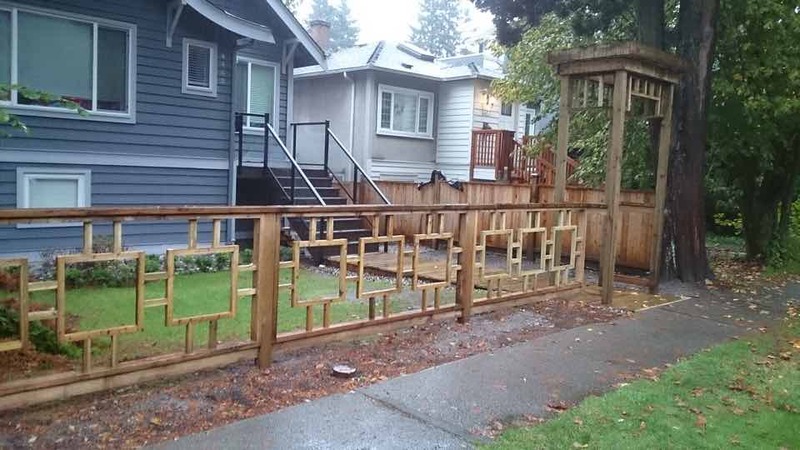 We replaced an old, dilapidated fence with this fence for this home owner. I had the pleasure of having Hubby for Hire redo my deck and a new shed. They are professional, courteous, respectful and very tidy. When they said they would be there, they were, and on budget! The final outcome of my deck was way more than I had expected. Ken has been with us for close to 9 months now. We were looking for a handyman who would become an integral part of our 73 unit complex, and who would over time, be able to anticipate problems before they occurred, and have the knowledge and skills to fix them. As he becomes familiar with our homes, Ken is able to make recommendations when repairs are required that will benefit other units within the complex as well. Ken is with us one day a week, or as sometimes happens, when we need him. It is very comforting to know that I can call him for advice, or for a quick look if we have an issue that can’t wait until his regular day. Easy to deal with, and always open to another opinion Ken has proved himself a competent and skilled handyman. I have heard of many nightmare cases involving home renovations completed by unqualified, dishonest contractors so I wanted the right person to do my renovations. In order to avoid extensive problems, I have done thorough research to find the right person. One of my inquiries from a respected structural engineering firm resulted in my Introduction to Ken Miller of Hubby for Hire. To test him out I started with small projects, all of which resulted in better than expected finishes. Subsequently, I hired Ken for larger projects, and as always he has delivered on his quality and thoroughness, and personalized customer services based on my needs. More importantly he has always met deadlines within a reasonable time frame and respected the renovations based on my budget. I would strongly recommend Ken to all my friends and family and will look forward to working with him again in the near future. I have had great experience working with Ken and his crew at Hubby For Hire. They have been competitive, versatile, and very reliable in getting the job done. We will continue to use their services in the future. To visit us, please call ahead as we're often at job sites throughout metro Vancouver. Office Hours: Monday: 8am to 5pm Tuesday: 8am to 5pm Wednesday: 8am to 5pm Thursday: 8am to 5pm Friday: 8am to 5pm We’re also available 24/7 for any home repairs, renovations & emergency services.